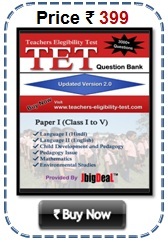 Teacher Eligibility Test known as TET is an Indian recruitment examination for primary and secondary teachers. The test is conducted by the State government and central government. Most of the state conducted TET exam for the recruitment of lower and upper primary teachers in schools from Class 1 to Class 8. Paper 1 is meant for teachers opting for Class 1 to Class 5 and Paper 2 for Class 6 to Class 8. It is conducted by both Central government and State governments in India. Most states conduct their own TET. The test is conducted in order fulfil and achieve the goals of the Right of Children to Free and Compulsory Education Act. 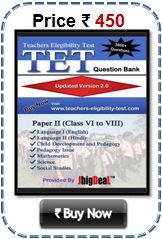 TET Exam 2019 Teachers Eligibility Test Paper I (Class I to V) Teacher, Paper II (Class V to VIII) Lower and Upper Primary Teacher Recruitment. For eg. If you want to became a teacher in CBSE school then you have to appear CTET exam likewise in UP its called UPTET exam. In this page, candidates will get all latest news and updates on TET Exam 2019 i.e. Teachers Eligibility Test. For e.g. we will update like Admit Card, Exam Date, Result and Answer Keys. www.teachers-eligibility-test.com it’s book not available in any book store or in any market. If you purchase it from any place other than www.teachers-eligibility-test.com please report us. Candidates of who wanted to be a teacher for lower and upper primary teacher must be passed TET Exam and As a part for TET 2019 Eligibility Qualification, applicants may grab B.Ed degree, before applying in any TET exam for this they have to join Universities for B.Ed Admission 2019. Teacher Eligibility Test (TET) 2019 exam Model Paper 2019 will help all the students for their TET exam preparation, here the TET Sample question 2019 is MCQ i.e multiple choice question answers.